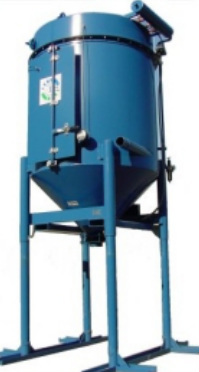 The VDC-4 is used in conjunction with a vacuum producer to capture the dust generated when recovering abrasive. The legs are adjustable so it ships at a lower height but can be raised to discharge into a 55-gallon drum or Super Sack. 6” abrasive dump valve (butterfly) on bottom of vessel. 4” Suction inlet connection to (customer supplied) the vacuum producer. 4” Dust recovery hose inlet connection to the (customer supplied) abrasive collection device. Structural steel stand (legs) allows forklift access to drum and skid under dump valve. Forklift pockets for handling when in the working position. 120 volt AC control box. Four (4) cartridge filters, part # 1000 1245. Differential pressure gauge to monitor filter condition. Not intended to be laid on its side with dust or with filters installed. Vacuum hose and hose to connect vacuum producer to the VDC-4 tank are not supplied.